Tomorrow ends another extended wander as I begin that long slow passage via bus, plane, and train back to the place my passport calls home. My final, non-airport evening demanded a visit to Altamira, a fine brewpub down the hill from my hostel. 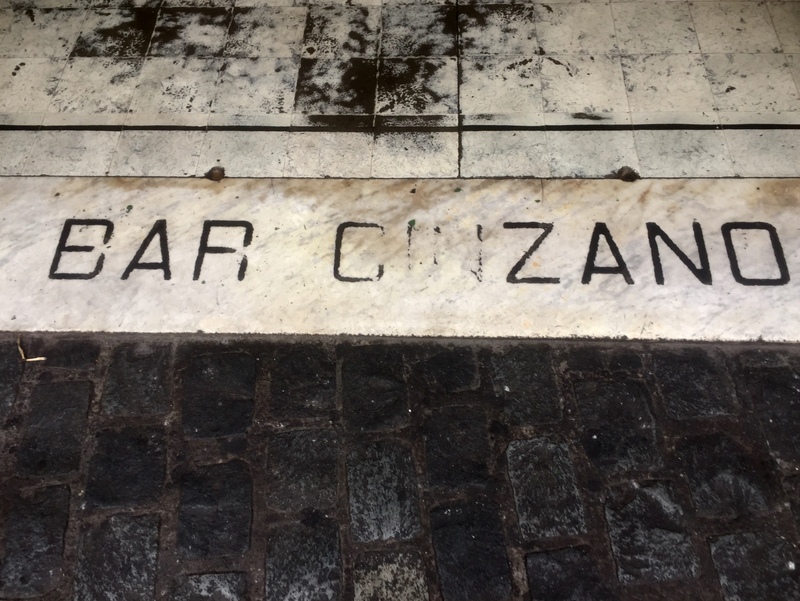 Just like my favorite Castro pub, it was not open when advertised, so, not wanting to climb back up all those dogshit covered steps, I drifted down to the square with Neptune’s statue, turning into the Bar Cinzano, one of my best random choices this trip. Established in 1896, the Cinzano is a classic bar, straight out of a Hemingway novel or a Chilean version of The Godfather. Fake wood formica counters with the pattern worn off, a line of wooden stools showing decades of sitting, little attempt at decor, just the slow accretion of objects— posters, boat models, a wall with 2014 World Cup brackets. It is a sports bar in the old-school sense. Not some space crowded with TV screens tuned to multiple games selling watery beer and hot wings to a clientele whose best days were in college and who still use the word “bro” without irony. No, the Cinzano has one, not-so-big screen and I am sure is crowded with long-time patrons and fans on match day. Many years ago I was in Paris for a conference, staying in a small hotel before the days when the rooms had televisions. It was during the EuroCup, so in the evenings after shedding my fellow conferees, I sought out a place to watch the matches. Across the street was a narrow bar filled with elderly Parisians, clearly their neighborhood spot. Against the wall was an old, big-screen tube television— a little grainy, but definitely fitting the decor. I entered to not particularly inviting stares, found a seat in the corner and quietly drank whatever beer they served (the French version of Budweiser). I sat through every game shown, returning nightly throughout the week, cheering for France and the Netherlands (which was at the time my adopted home). As the nights passed, I was greeted with familiar nods, and, toward the end, the patrons were all cheering for my Orange—Hup Holland! unless of course they were playing France. 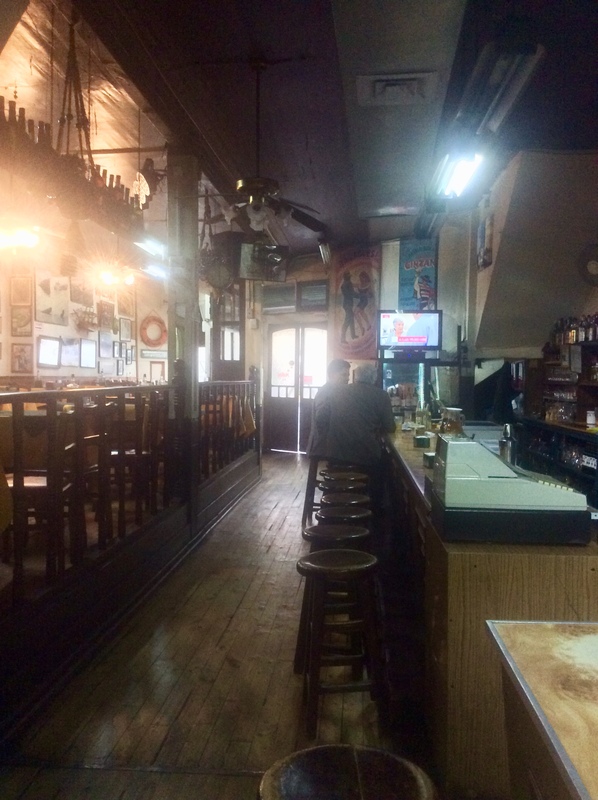 Clearly I was an outsider at Cinzano, ordered a Quimera pale ale (Santiago brewery), and watched the regulars pass through, as familiar to each other as the worn counters. If I lived in Valparaiso, this is where I would stop at the end of the day, and definitely is where I’d watch football. 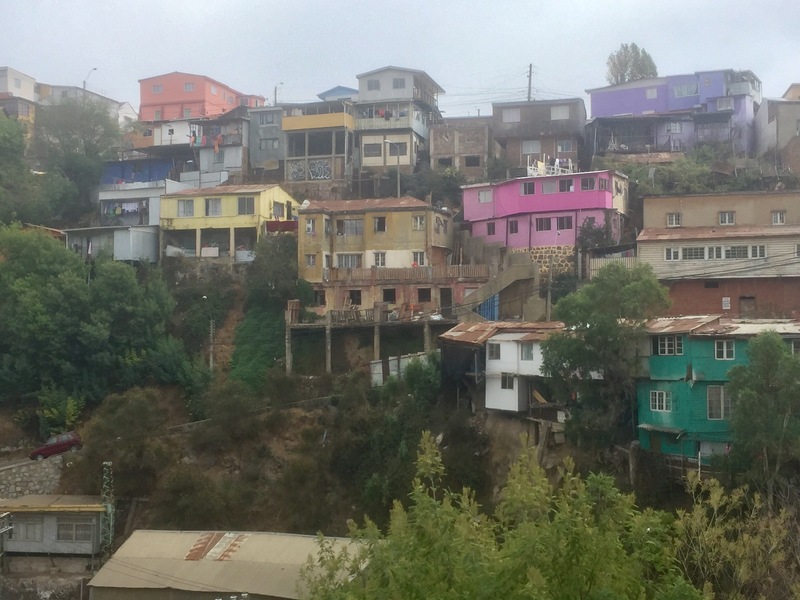 So grateful this last little wander gave a glimpse of old Valparaiso. 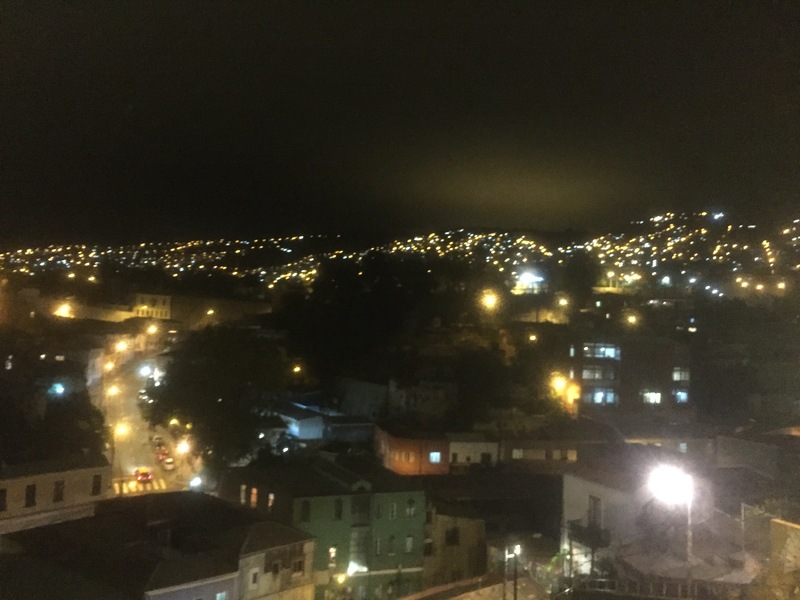 In Valparaiso, the first time in a city for six weeks. 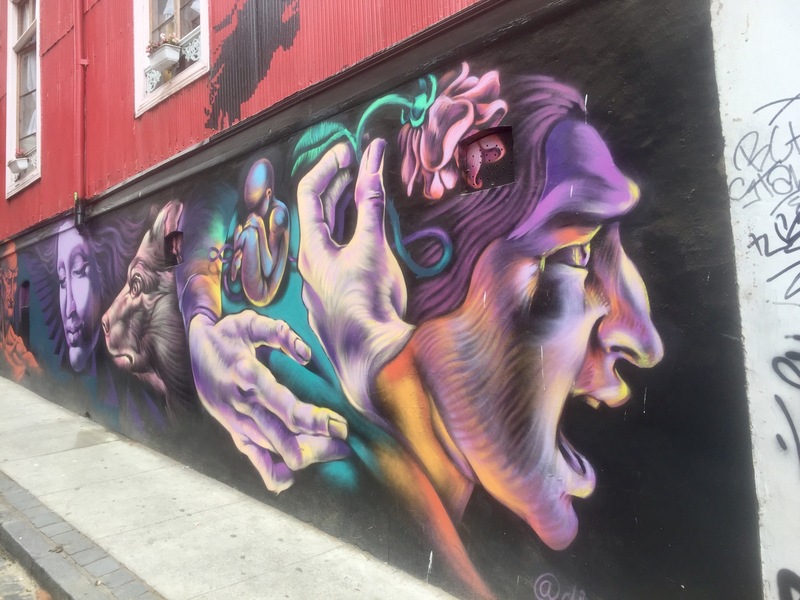 Wandering Patagonia took me through a litany of fascinating but small towns—Punta Arenas, Puerto Natales, El Calafate, El Chaltén, Castro, Puerto Varas, Pucón. 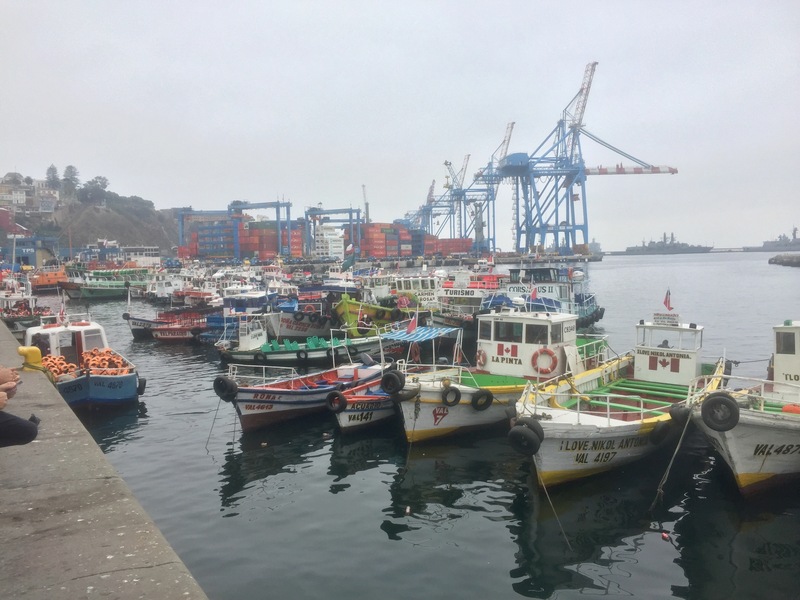 Valparaiso is a true port, touched by the Beagle on its cruise with Darwin and visited by Herman Melville as a young sailor and also the port of origin for his fictionalized account of a slave ship uprising “Benito Cereno.” Today there are acres of concrete piers with multistory cranes casting long shadows over shipping containers stacked 10 high. The main part of the city is on a fairly flat band of land following the coast, looking very much like the earthquake uplifted land banding Wellington. There the high rises, corporate and government buildings, and warehouses fill in blocks relieved by the occasional park, including the imposing memorial in Sotomayor Square in the shadow of the Naval palace. I wandered through some of that area early Saturday morning from the bus, dodging the relics of some serious Good Friday debauchery. The port also accommodates tourists, and on this busy Easter weekend they swell the crowd. 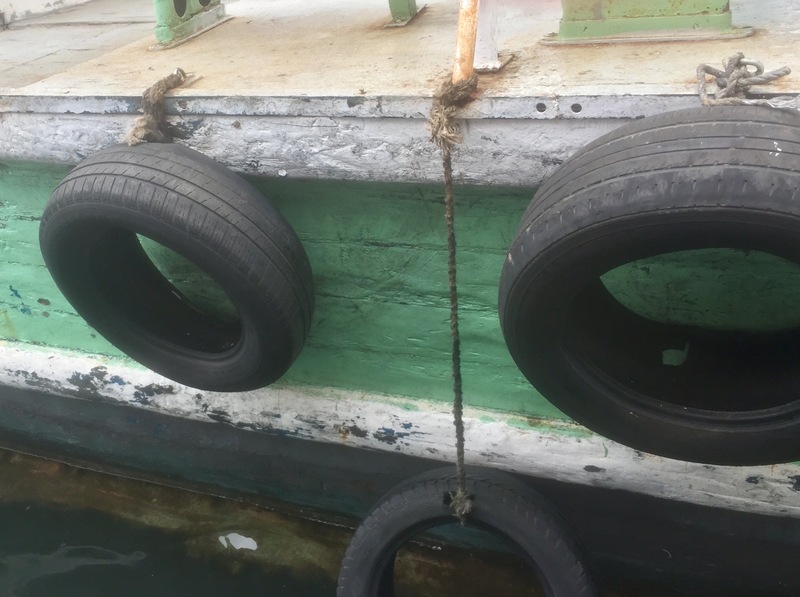 I took the dollar harbor tour on one of the many elderly wooden boats (in some parts the paint was thicker than the wood). Though probably a city safety rule, it is a little disconcerting to see everyone wearing their life jackets before the boat pushes off from the pier. 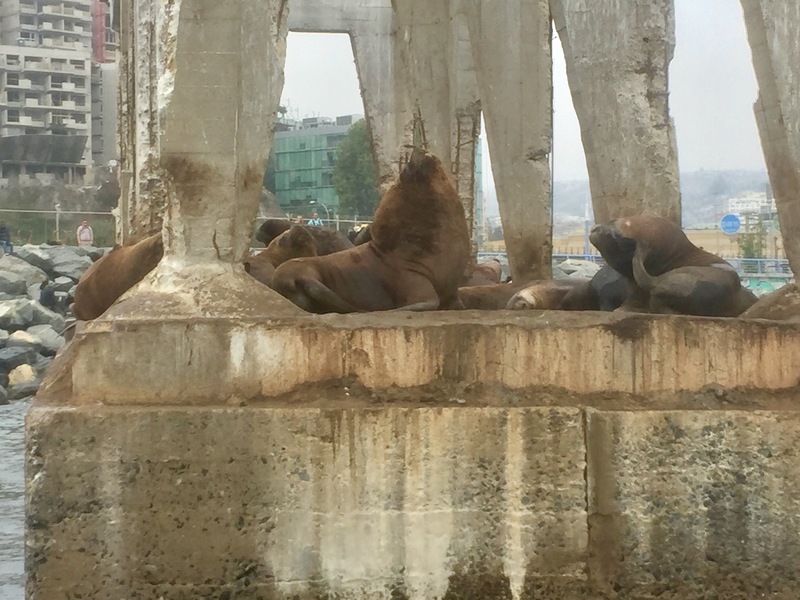 We coasted along the city to a point across the harbor where a decaying concrete dock provides habitat for some well-fed sea lions. I’m sure they are oblivious to the fate of their ancestors at the hands of 19th century “sealers” like Amasa Delano, the other captain in Melville’s “Cereno” or the many inhabitants up and down the coasts pursuing skins and boiling blubber. Seeing the city from the water — as Ezra Pound would say “not as land looks on a map/ But as sea bord seen by men sailing”—shows how the city is formed and how the people live. Rising up from the lower level are a series of ridges, all covered with houses. Between ridges are deep ravines that effectively divide the city into segments. I walked up from the pier, climbing long steep stairs as the trolley was being repaired—many steep places are serviced by old vertical trolly cars—finding myself one ridge over from where I wanted to be, requiring my climbing to the very top of the high ridge and descending back into my neighborhood. Clearly affluence varies in relation to these different sections. Superficially, this place that reminds me of Lisbon or Porto. Big fishing towns facing an ocean to the west, built on cliffs and steep hills making interesting levels. But some cultural differences make the comparison complicated. As always I found the best brew pub, and later a good seafood restaurant. The beer was great (including Jamaican Dream IPA which was green, really strange tasting and maybe a real 4/20 beer). 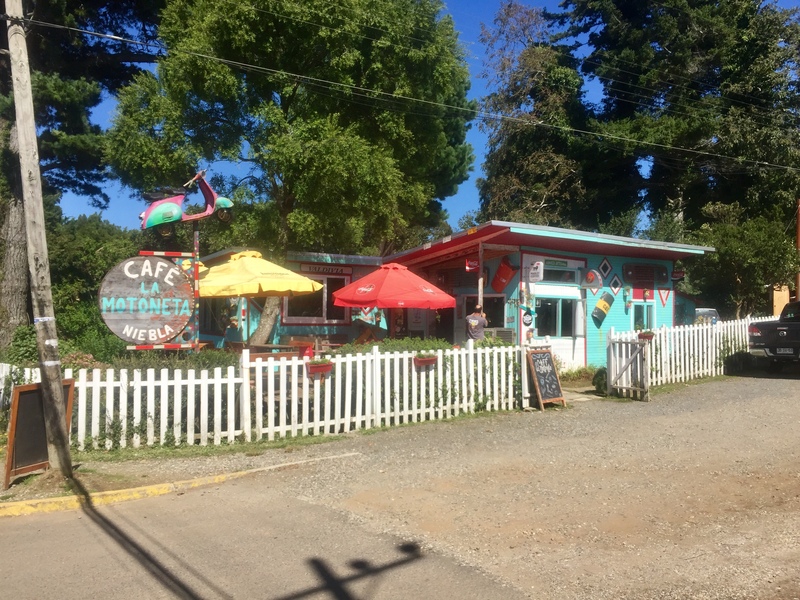 And the fish was wonderful, but the staff in both places moved at a frenetic pace. Of course this is a holiday weekend and the city is packed with visitor (primarily from Santiago), and I understand the need for good, quick service, but both places made me nervous, wanting to finish quickly so the jumpy staff could fill the table with the next party. In Portugal, your table is yours—no one will hustle you out the door. The pace of life there is human, not economic. 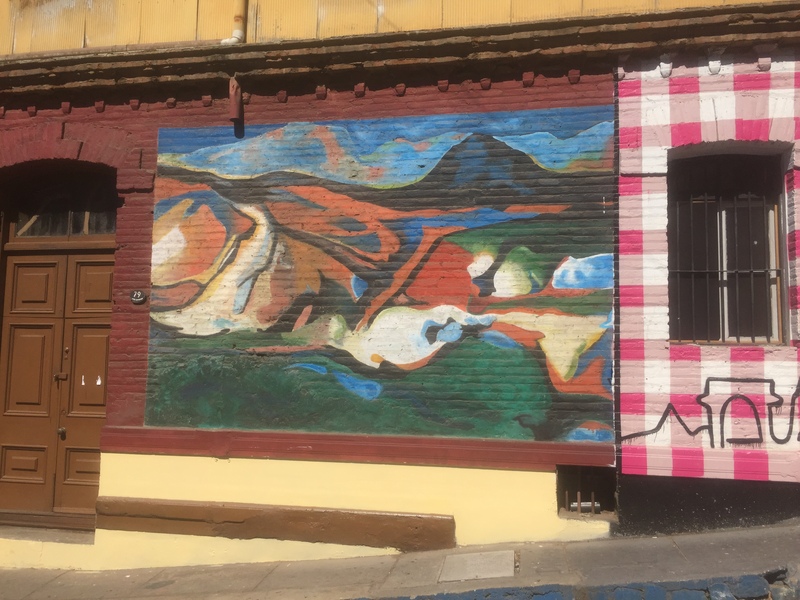 Perhaps I’m being unfair as it was a busy time, and I do love this city, particularly its out-of-kilter structures, sidewalk life, and of course the murals—pure delight. 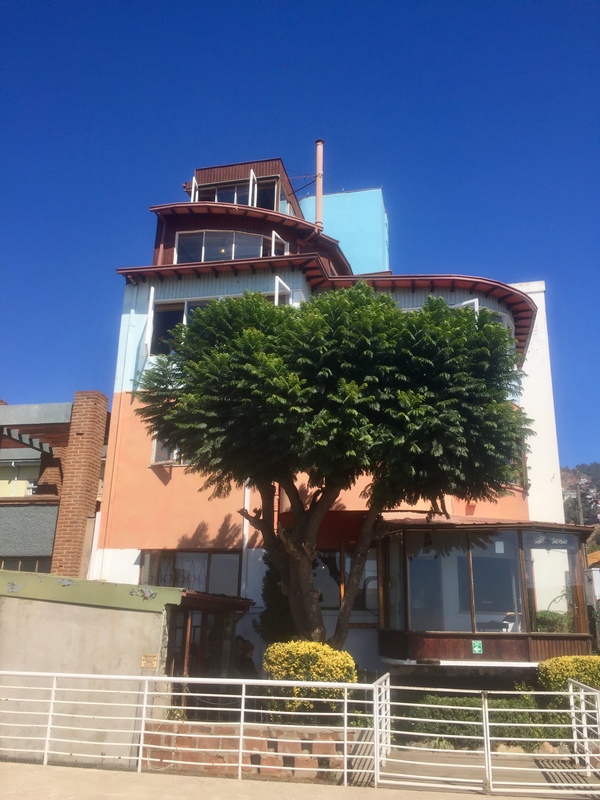 There were no seashells, there in Neruda’s house. Maps, boats, and bottles, but no shells. Pablo, where did you leave them? And why is there no trace, except a mother-of-pearl inlaid table which I’m sure didn’t come from your beachcombing? They said you thought water tasted best when drunk from green glass, so there is plenty of that, even an oversized bottle of Brut by Fabergé cologne which made me think more of Joe Namath than the words of a great poet. Joe in a full-length fur coat would be out of place next to your jar-shaped fireplace, French carousel horse, or your chair of the clouds. But the words, those you traced in green ink every morning high upstairs in your study were of that same color—distinctive and flavorful. And there in that room is an American from New Jersey —the looming photograph of Walt Whitman containing multitudes even in Chile. William Carlos Williams, another poet from Jersey, old and partially blinded by strokes wandered the beaches of Florida collecting shells thinking of you, straining after the rhythm of the waves perhaps like his friend Wallace Stevens whose Key West apparition “sang beyond the genius of the sea,” striding by the shore, but for him “it was she and not the sea we heard.” Stevens listened to the she/sea with Ramon Fernandez, Williams with Pablo: “the/ language also of Neruda the/ Chilean poet—who collected/ seashells on his/native beaches.” La Sebastiana, your house, echoes still with the sounds of dinners of conger stew, French wine, and politics—that which could never be ignored. But the sea also cannot be ignored, and Williams heard it in your words, trying in his own: “the/ changeless beauty of/ seashells, like the/ sea itself, gave/ [your] lines the variable pitch/ which modern verse requires.” William Carlos Williams, looking to the language of his mother and his own middle name, came to your poetry and in his declining years wrote for you a poetic tribute that, for unforeseen circumstances was not delivered until you too were dying and soon dead. 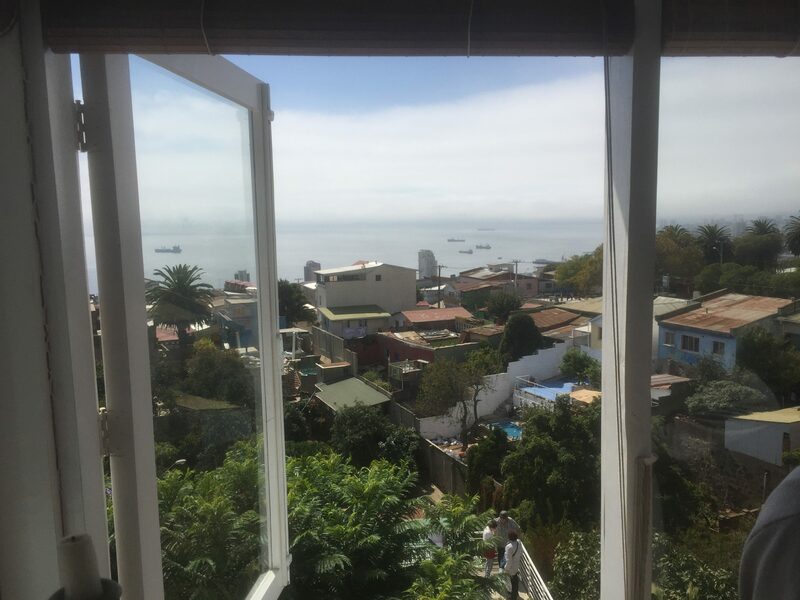 Good Friday in Chile is a Catholic holiday where mass seems to be held on the street with everyone crowding sidewalks and restaurants enjoying food, drink, and sun. What I love most is how all the young children are part of the parade, squealing, laughing and sometimes crying but never for long (the person with the baby stroller franchise is wealthy). Really beautiful day. Yesterday on top of Villarrica, I could look down and see the lahar paths of recent eruptions—‘64, ‘71, and 2015. What look like tangled river valleys are masses of slowly eroding lava, or tailings of basalt and andesite gravel mixed with ash. Also clearly visible is natural reforestation. Driving out of the park, the roadcut was a textbook crossection marking out the recent eruptions with thin bands of dense rock between thick layers of loose material. From the van, I could see stages of regrowth, mostly nothafagus with some Araucaria interspersed. There were island stands of old growth nothafagus alpina, but most were young, regenerating the forest fast. A few months ago I attended a panel at an academic conference where some theorists and artists who had been working on animals were engaging in a discussion of plants (fields known these days respectively as Animal Studies and Plant Studies). While each presentation was interesting and intelligent, I kept feeling that something was missing. I think the emerging field of Plant Studies can be viewed as extending the principles of Animal Studies to other forms of life. By re-articulating the historical construction of the human, Animal Studies has figured prominently in scholarly engagement with the idea of the Anthropocene. While Plant Studies can be enrolled in the same effort, it is important to see what else it brings. For Michael Marder “Plant-Thinking starts with the explosion of identity.” While this can be read as another critique of the traditional humanistic subject, Marder is also pointing toward an explosion of individuality. In Animal Studies, the unit of analysis is primarily a semi-bounded biological entity defined at least in part by a central nervous system, but Plant Studies doesn’t focus on the individual. Plants insist on being studied as a complex and tangled relation with biological others (and actually confounding many senses of the word other—e.g, Lichen Studies). One of the talks focused on a planting in a gallery, essentially potted houseplants (which in some ways is monoculture writ large—well, actually in this case, small). While the artist might be commenting on objectification through gallery presentation, the plant itself, isolated from its own co-conspirators, is also being objectified in a traditionally humanistic way—a single entity to be named and counted. One of the other presentations was on large scale drawings of individual plants, a sort of scaling up of 19th century botanical illustrations. Again, while fascinating, this foray into Plant Studies treats them as individual monads, in much the same way that European explorers scoured the globe for specimens to send back to Kew or other repositories. Our treatment of plants as isolated individuals (defined, categorized, counted, and patented) is fertile ground for biopolitical critique. What I thought about while traveling off the volcano through a regenerating forest were the multiple actors in that scene. 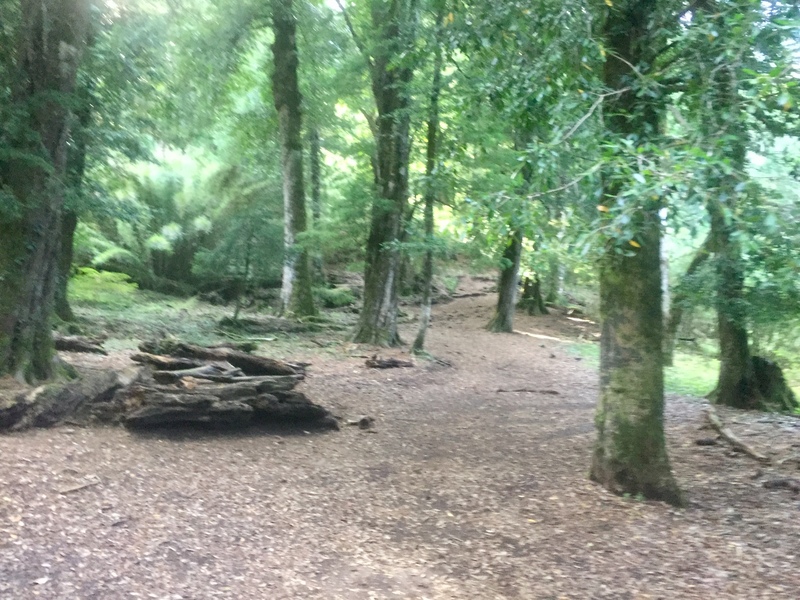 The birds and mammals, and a complex tangle of insects, microbes, fungi, and minerals along with a fairly constant rain of ash and chemicals, which with the trees makes up a forest. Plants in the wild are always multiple. I have long admired and read animal studies scholars. In fact I’m friends with many of them and this is very much a straw-man argument, drawing as it does on one non-representative conference panel. But that helps make a distinction which, while not absolute, has a level of stability. What is exciting about Plant Studies is the multiplicity it demands. Regarding semi-closed biological systems such as mammals can point back toward a residual humanism, comparing like with almost-like, while plants require a much more open and fluid mode, what Marder and Irigaray term plant-thinking. Jannice Ray’s classic Ecology of a Cracker Childhood helps bring humans and their detritus directly into that mix, including, in her case, Long-leaf pine, gopher tortoises, red-cockaded woodpeckers, wiregrass, barbed wire, junked cars, snakes, and young playful children. You can’t talk for long about a single tree or plant; instead you have to think the forest. Over the years I’ve made innumerable hikes—day hikes, long weekends, or multi-month treks—and used a lot of different equipment, but never have I had to carry a gas mask until today. 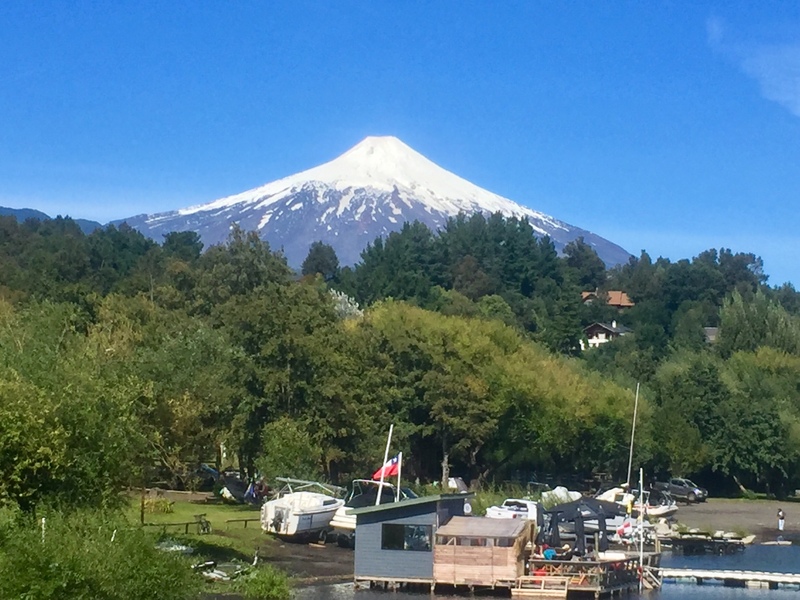 Pucón is a tourist town, with hot springs and winter skiing, but the main attraction is Villarica, an active volcano looming over the town, almost constantly smoking and occasionally erupting. 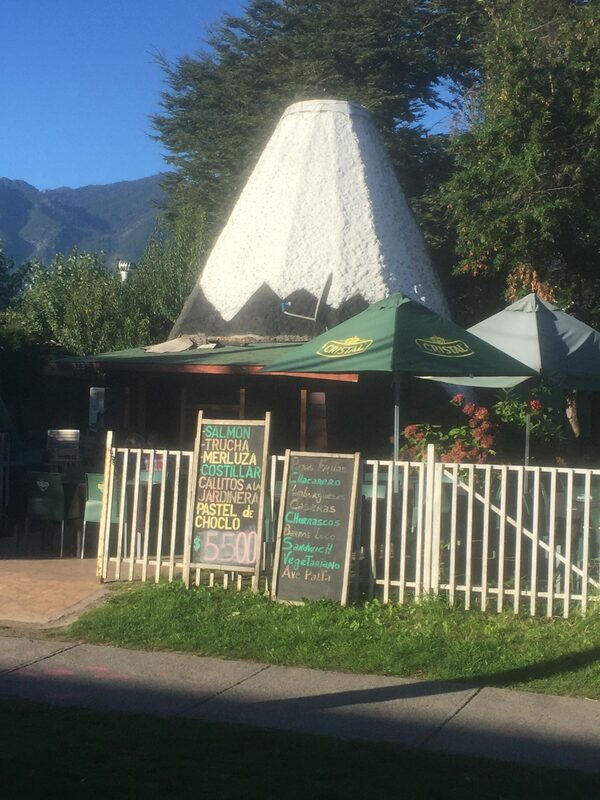 Also known by its Mapuche name “Rucapillán” which means “spirit’s house,” its elevation is 2860m, so the peak remains snow covered year round. 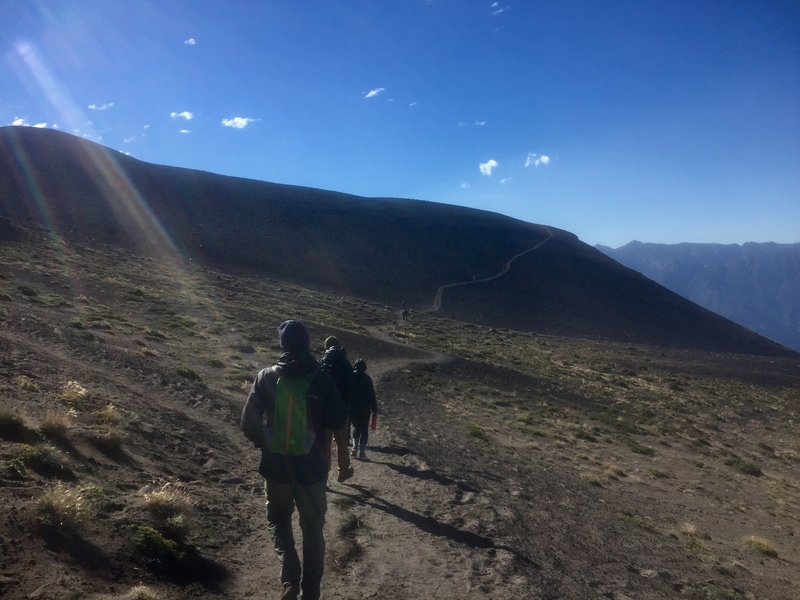 Almost exactly two years ago, I climbed Kilimanjaro which clocks in at 5895m, so a stroll up to Rucapillán’s peak seemed in order. Even though on clear days hundreds of people make the climb, it is anything but a stroll. Not close to the height of Chimborazo, the volcano that pulled Alexander von Humboldt with such force, or Kilimanjaro for that matter, Villarrica does not require precautions for altitude sickness. Instead, because of its active status, care must be taken on the peak regarding the fumes which contain sulfur dioxide and hydrochloric acid. The climb was rigorous for a couple of reasons. In order to go up, you have to work through a tour company which provides the necessary gear including boots, crampons and ice axes. 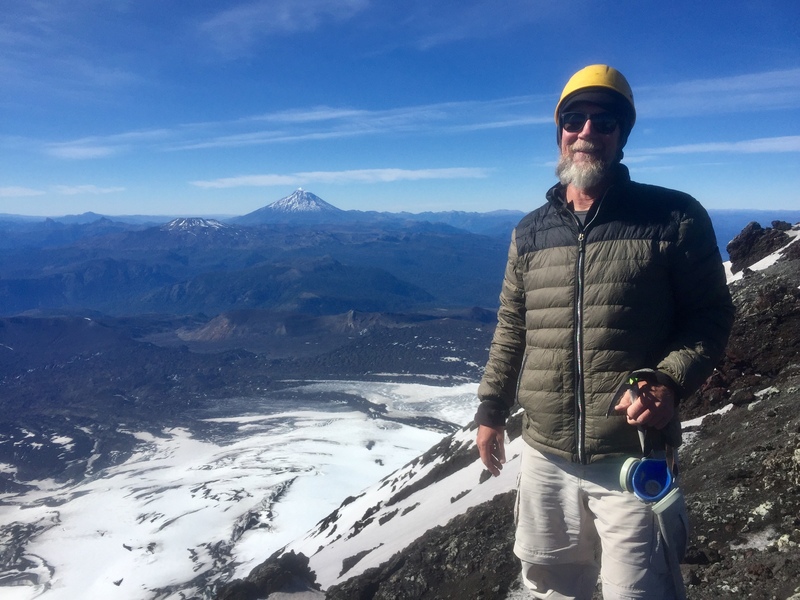 The first half of the climb is on fairly steep loose scree—basalt and andesite ranging in size from powdery sand to knee-high boulders—and big boots can be clumsy, particularly while using an ice axe as a trekking pole instead of standard height sticks. The last part is up the ice field and requires wearing crampons and following closely the hacked steps of the person in front. The day was perfectly clear—really one of the best days I’ve had on this whole wander—but the report called for higher winds later in the day, so the guides wanted to hustle to the top early and kept a strong pace. 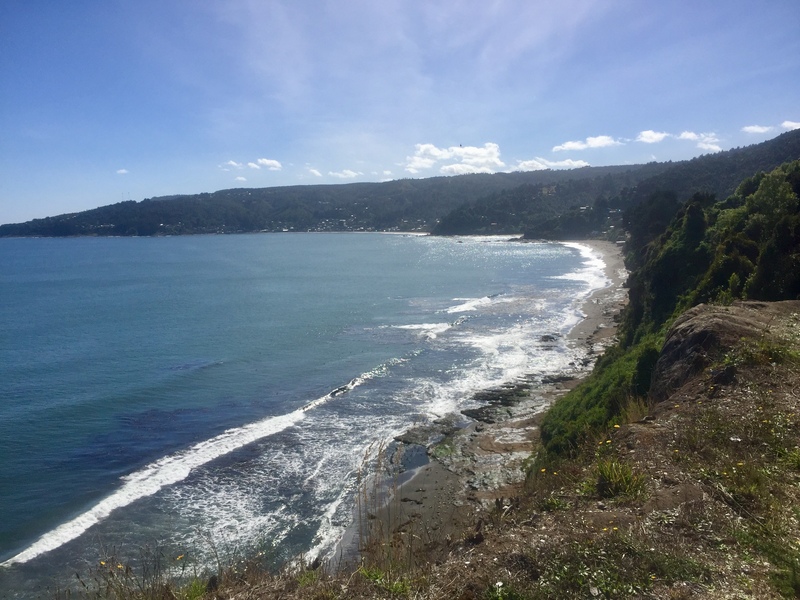 The group was small—some Israelis taking their post-military service world tour, some Chileans from Santiago on holiday, and Chloe, an Australian environmental scientist squeezing every last bit of excitement into the remaining hours of her trip. Though I’m in pretty good trekking shape just now, crampon walking uses muscles in a slightly different fashion, so I was hurting near the top. All discomfort dropped away at the summit as the sky remained clear and the winds held off. From the edge I could see the lines of Andean volcanos stretching both north and south, helping me to understand Humboldt’s attraction to these mountains as he wanted to determine if volcanos were isolated peaks as they seem in Europe or part of a much larger geological system. 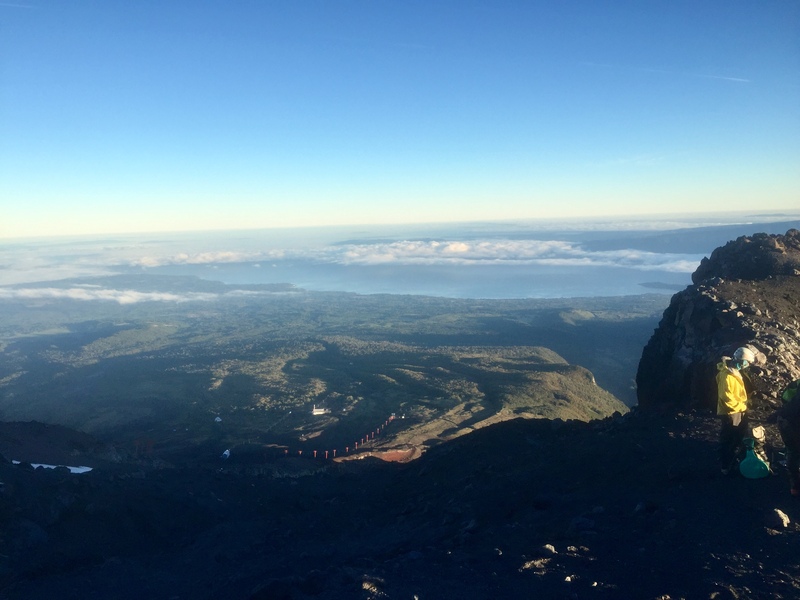 Standing on top of Villarrica on a clear day shows just how big that system can be. A loud rumbling, banging sound prompted a turn away from the view out to the one in. 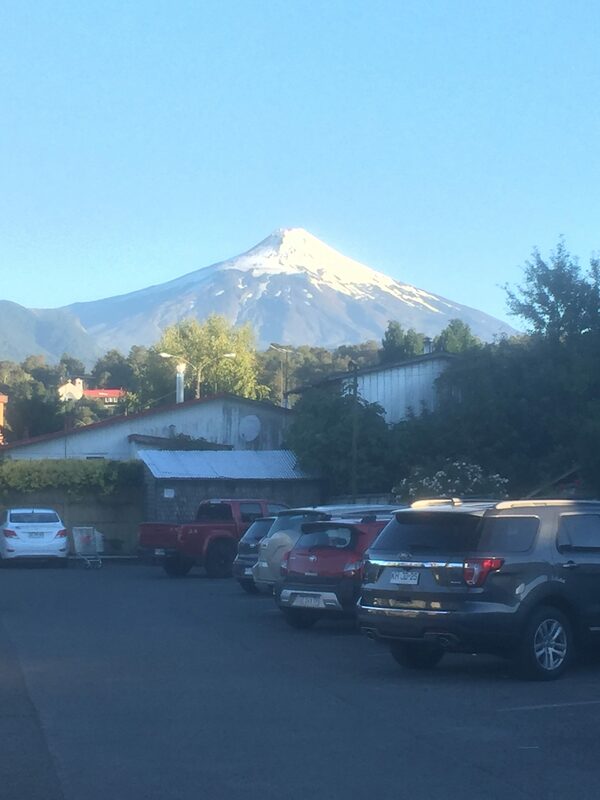 Villarrica is the model for every child’s science-fair paper mache volcano. A perfect cone rising out of a flat plain with a nearly circular crater at the peak, spewing gas, occasionally showing a lava lake (though not today). 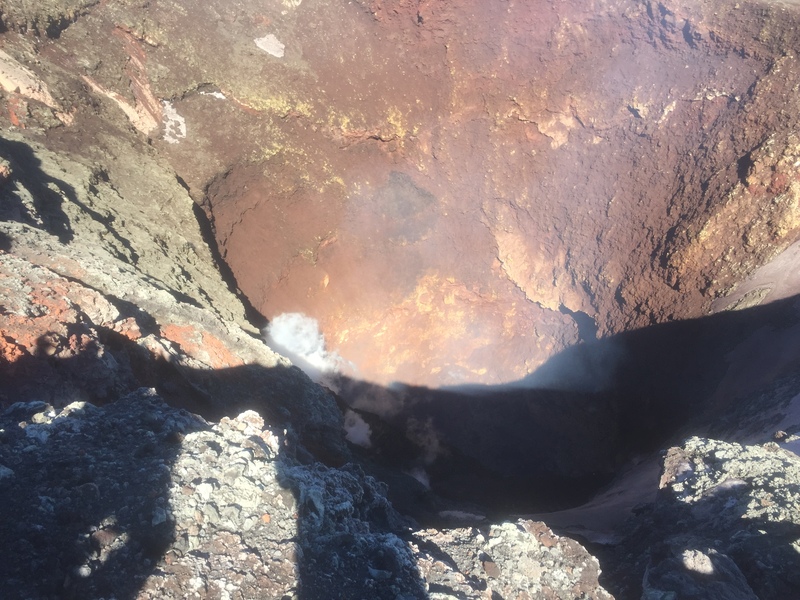 Regular bursts of steam and gas came from a vent near the bottom, and once a large cloud of dark heavy material belched up, but most exciting or disturbing was the sound. I suppose Dante could provide some good descriptions but to me, it sounded like there were workmen in the basement taking apart a big furnace, which is guess is sort of what Villarrica is. As if staring into the maw of hell wasn’t enough for one day, the tour group had another card to play. Descending from the crater’s edge, we gathered at the ice slope, put on heavy pants and coats along with a slick nylon “diaper” and proceeded to slide down the ice slope through tracks like crude bobsled runs. 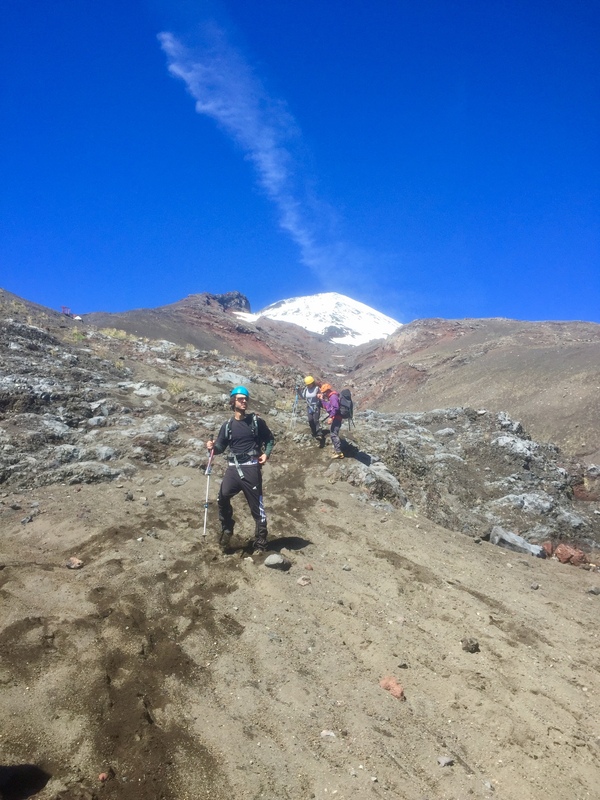 Braking with ice axes, we lost all that hard fought altitude in a matter of minutes, then trekked the last bit down soft, loose volcanic ash. It was a little over the top, but hey, it was a volcano. A rainy day in Pucón. Annie, a woman from Frankfurt I met in Valdivia and then ended with on a bus to the National Park (such meetings between us wanderers is common—I talked a long time to a French couple today who I first met in Puerto Natales) recommended a coffee shop where the owner roasts his own beans. Coffee is a common conversation among wanderers of Patagonia, with everyone initially having assumed that, since much coffee is grown in the region, it would be delicious. Generally speaking it’s not. Often instant Nescafé or, if drip, it has an almost indescribably bad flavor. Clearly (for those who have been following my travels) I have found wonderful places for a cup, but they remain the exception. All Annie could recall was that the cafe was near a Subway—yes there are Subways here but they have trouble competing with the little stalls selling empanadas, and the restaurants selling sandwich “completos” (more on those in a bit). Pucón is not large so Google Earth landed me at a Subway in a Chilean version of a strip mall, and there was the Madd Goat. Turns out it is run by an American from Minnesota who went to Colorado College, found himself spending a lot of time in Chile and got tired of bringing coffee in from the States. Taking matters into his own hands, he and his wife bought a roaster and now make some of the best coffee in Patagonia. What I found unusual though was how this shop magically attracted Americans (probably in lonely planet or something), the first that I have encountered. To be honest, I’ve met very few Americans on this trip—the dominant non-Patagonian people are German, but I shouldn’t label them all visitors as there is a very large proportion of the population of Chile and Argentina from Germany (dating back to the 19th century) and in places they maintain their language and culture. There are German schools in Puerto Varas for example. So I ordered a cafe con leche, settled in working on some abstracts and listening to the rain, only to find myself listening instead to some whitewater instructors from the NOC in North Carolina at the next table. Other Americans drifted through and some English speakers from the UK and Australia. It was disconcerting to sit in a place where I understood the neighboring conversations, reminding me how much I enjoy the hum and buzz of a coffee shop where I have no idea what is being discussed. Of course all countries have slightly different ways of doing things. In good cafes in Chile, the coffee comes with a small cookie (like so many other places in the world) but they will sometimes include a shot glass of cold, sparkling water. I wish other places would catch on to this, as it is refreshing, though I remain unsure when to drink it—first while it is still cold, or after as a palate cleanser, or in sips in between? I need more empirical research to answer that question. An other thing they do here (which makes Subway’s business difficult) is serve sandwiches or hot dogs “completo ”. Now, just to be sure, even with a strong German heritage, the hot dogs are not brats, but instead are those gray centered, bright red casinged, artificially colored tubes just like those sold by Ignatius J. Reilly in John Kennedy Toole’s masterpiece Confederacy of Dunces. Whether dog or sandwich, “completo” includes a number of sauces, chopped tomatoes (and they are great tomatoes), chopped onions, sliced avocado, and god knows what else. There is more material than could fit into any bun, roll, or bread, and it is then held together with a mass of mayonnaise layered on in exactly the way a bricklayer butters a brick. The result is physically almost impossible to eat, and those wonderful individual ingredients tend to loose a lot in their “completion.” You may ask about hamburgers and the answer is the same. 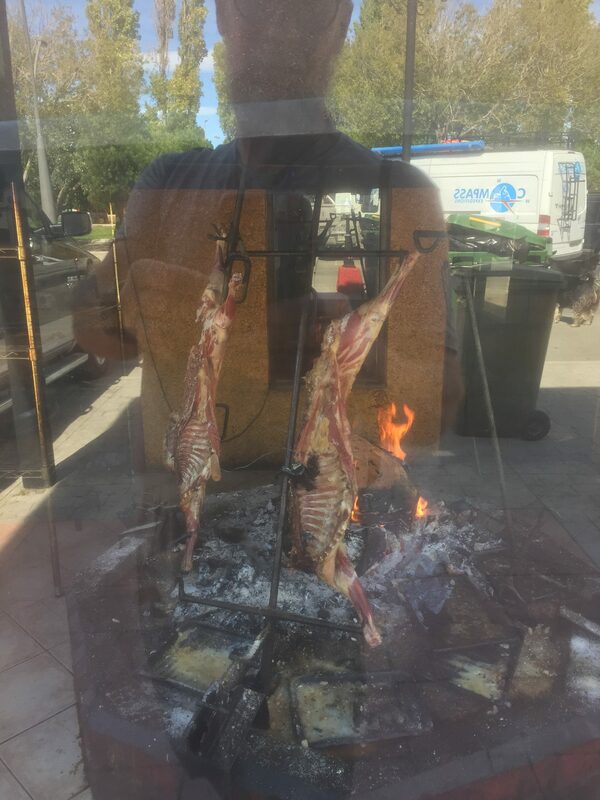 A region known for amazing beef (and the Parilla restaurants with their burning logs stacked in a grid between two large flat grills, providing coals and all ranges of temperature for grilling which rewards the carnivore) decides for some reason to bury that meat in layers of “completo” such that it cannot be eaten as a sandwich and the burger itself cannot be tasted. (I’m looking forward to a Littles burger basket on my return to Atlanta). Some years ago I spent a year living with my family in Maastricht, Netherlands. While walking Umbro the dog around the neighborhood, I always stopped to puzzle over a tree that was strange to me—contorted branches covered with thick green scaly leaves. On the one hand, it resembled a really bad artificial Christmas tree, but on the other, it was a truly fascinating plant. 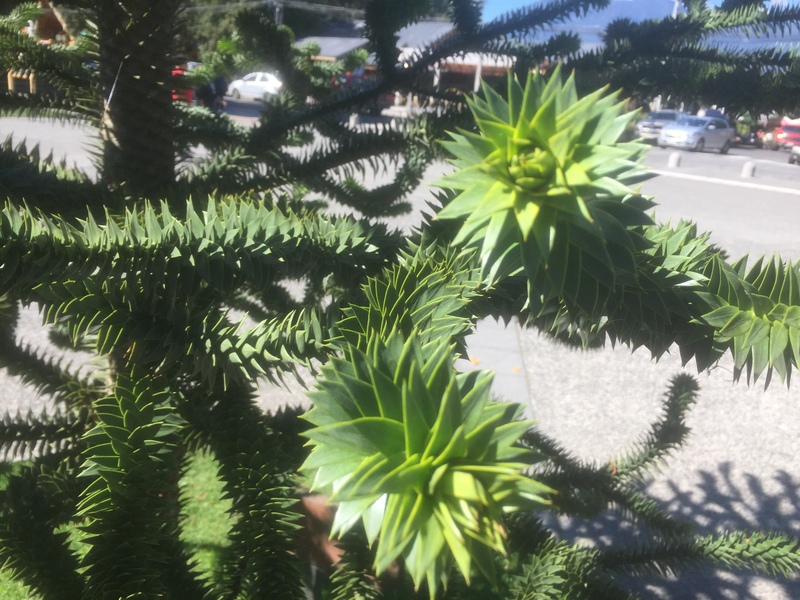 My neighbor called it a Monkey Puzzle Tree. From then until now, I always assumed it was an interesting if odd ornamental landscape tree. Today I learned different. I caught the early bus out of Pucon to the Huerquehue National Park, one of the oldest such parks in Chile. My plan was to hike a fairly short but still rigorous trail up out of the valley to a series of high Andean lakes, and return. In hindsight, I should have planned to camp there, but I was to meet back up with my German geographer friends in Pucon that night, so my trekking speed was determined by the return bus departure time. Even though my pace remained constant, time itself slowed considerably. I was walking primarily to see high lakes and granite upthrust, but I soon found myself in an ancient forest. There were the by now familiar Nothafagus Alpina, but they were growing on a scale I had not encountered. Indeed, I probably wouldn’t have recognized them except the path, just as in New Zealand and southern Patagonia, was layered in that carpet of dry brown leaves so perfect for old knees. The higher I climbed Alerce started to mix in. 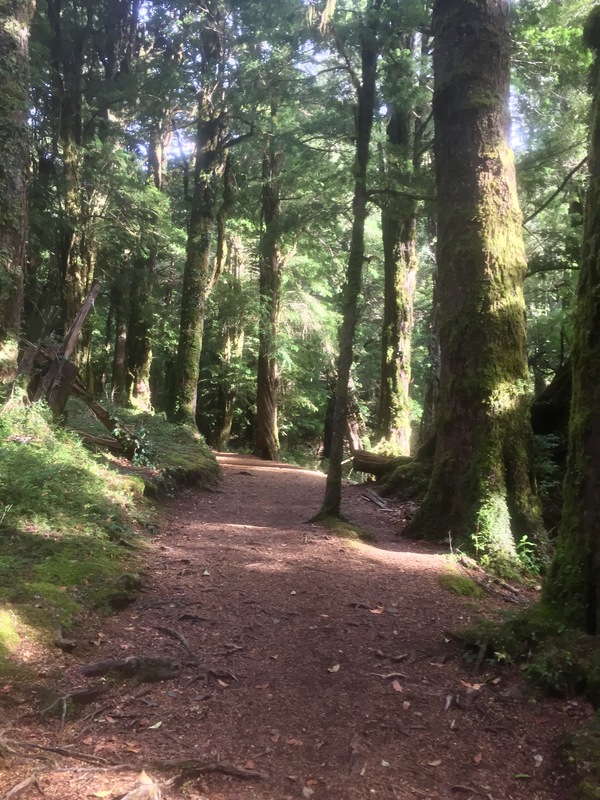 Not a tree I recall ever seeing, the Alerce looks a lot like a sequoia—huge tall trunks, limbless until the tops which are green with short thick needles. The steepness of the terrain and the mix of large trees made it difficult to separate out an individual tree for contemplation. It was even hard to connect visually the base of any given tree with its crown, so none stood out as the perfect isolated specimen. Instead I was invited to see them all as part of an incredibly diverse and complex forest, which by the way, is how we probably should regard trees. I appreciate the notion of individual “Champion” trees—most states or cities in the U.S. keep a register—but to know trees is to see them as forest. Which brings me back to that isolated Dutch Monkey Puzzle tree. 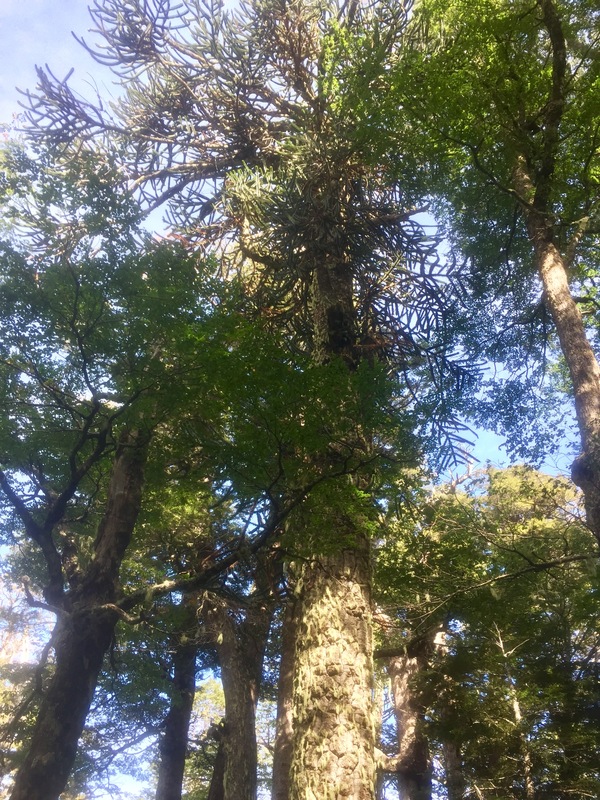 On gaining the plateau with the high lakes, I entered an area with a concentration of Araucaria araucana (Monkey Puzzle) in their actual habitat. Here the trees are not strangers in a strange land, but instead have long made their home. 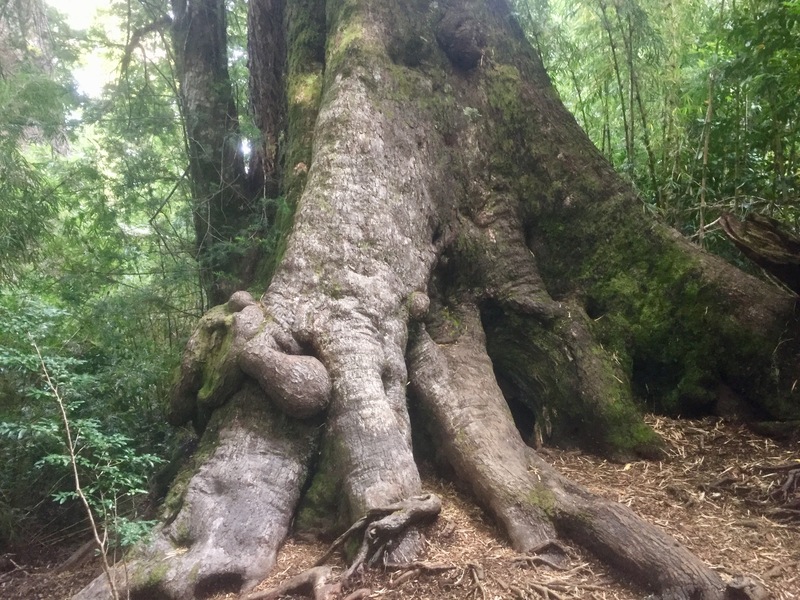 Not garden specimens, this ancient forest contains trees well over 1000 years of age with trunk diameters of 5 feet or more. 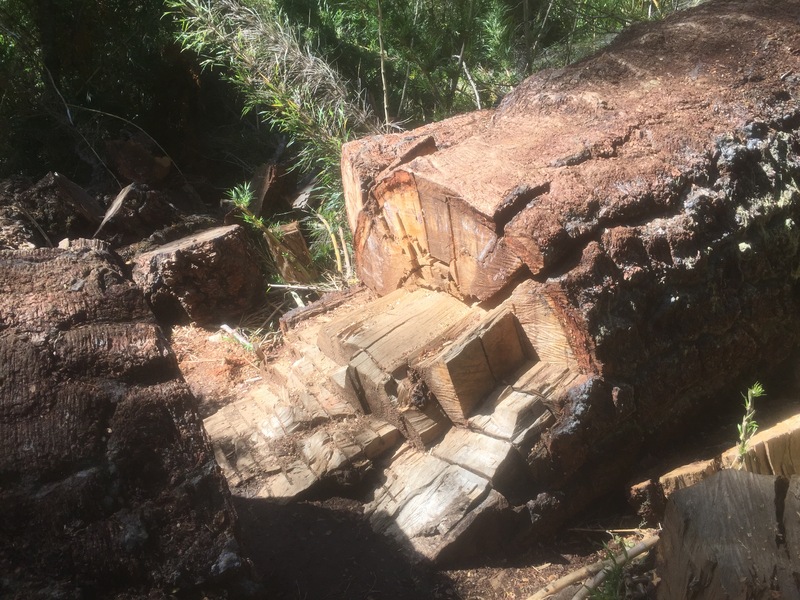 At one point the trail went through a recently fallen trunk that had been cut through to enable passage. Its diameter was easily greater than three feet. The living trunks can be distinguished from Lenga and Alerce by an almost rectangular bark pattern with a grey-green moss growing in the interstices highlighting the shape. Of course a glance up gives glimpse of the distinctive branch/leaf pattern, but even then, they are clearly part of a forest, albeit a forest of giants. Eduardo Kohn has me thinking about paths, cognition, and temporality. The other day I wrote a bit about walking as both depending on and enacting a future. The regularity of rhythm depends on the possibility of continuing, obviously with constant ongoing adjustment—walking is both difference and repetition as well as a necessary creative advance into and constructing of a future. But when you get lost, even if only for a moment, it (the path + walker) marks out a past—many feet maintaining its status as path, uniting you with others, confounding the idea of a solitary walker. Kohn had me further puzzling about how paths think, how they relate to distributed cognition (e.g., Edwin Hutchins), and since I was out walking myself, that somehow brought me to the often poorly read Robert Frost poem “The Road Not Taken.” Throughout he uses the verb “took” rather than “chose.” To draw a simple moral from the poem (something all those high school graduation speakers feel necessary), the emphasis tends to be on chosen, on personal agency and responsibility, something an active sense of “took” can bring (particularly is the tones of meaning tend toward possession) but took also brings as sense of collaboration (took and taken), spreading responsibility not just to person but also in this case to path, that path which, while currently empty, is inhabited by hordes of past walkers, taking their leave because of the affordances of surface, inclination, and general habitability of the way. Paths manifest innumerable steps, countless choices, and present walkers with choices constrained by human and nonhuman multiplicities. Cognition, agency, choice—infinitely complex. That puzzling about time took me back to this—Footpaths—which does a better job of articulating these ideas than these current musings do. Another transition day (though will be here for a while). Glad to leave Valdivia, not so much because it’s not interesting, as I just had a textbook bad hostel experience. Pretty much the whole crew (including the young women who actually work there) decided to party—so everyone was loud until about two, then they went out, returning in small groups talking loud and slamming doors. By about 5 they were all back and alternated running to the bathroom to puke (except one of my roommates who didn’t make it to the bathroom). Ahh, the hazards of really cheap travel. Pucon is a fresh start, a tourist city that has a funky feel. Spent afternoon wandering— feels like a one-story ski town. Evening is cool but not cold, and families are wandering the streets—small children on their parent’s shoulders just looking around. I’m lining up some good walking and will meet back up with some geologists I met down south. And of course there is a volcano to climb, but for now, it would be cool to find an NCAA basketball game on a TV somewhere (not likely). Today I was re-reading Eduardo Kohn’s book on forests and anthropology, and came to a section on anxiety I had forgotten. He uses a personal story about risk while traveling to unpack Pierce’s semiotics and begin to work out his idea of forest thinking and an anthropology “beyond the human.” I had taken a bus to the village of Niebla, site of a complex of forts designed to defend the entrance of the waterway to Valdivia. 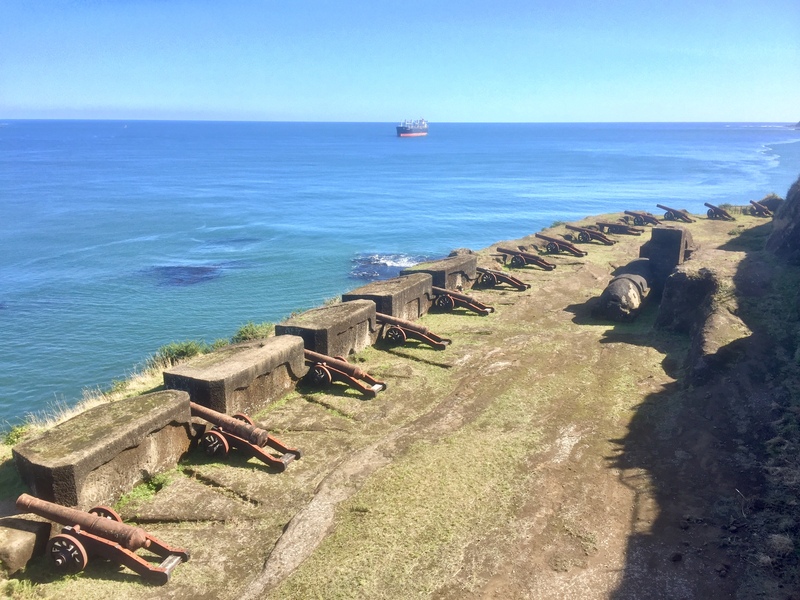 Niebla was flattened by the 1960 earthquake, but the castle, which was cut from the solid rock cliffs above Corral Bay, survived (more or less) and now is a well-designed park/museum. After wandering around a bit, I found myself sitting in the town plaza on an old bench with peeling paint, waiting for the Cafe Motometa to open. I got to thinking about Kohn’s description of travel anxiety, and reflected on my own. The very beginning of this trip was a little unsettling as I experienced anxiety at a level I rarely if ever have. Just two years ago I rolled through a round-the-world walkabout with barely a care in the world, so my early stress on this trip was disconcerting. What I was sure of today was that sitting there in that square, listening to a man talk rapidly in a barely recognizable Spanish while a bird that seemed a small tame raptor pecked at the sidewalk, brought a feeling of simple peace. One form of anxiety travel produces is the fear of missing out. Everyone compares lists of walks, climbs, or boat trips that are not to be missed. When long-distance trekking, that stress is relieved as what you are supposed to see is the path, day in and day out, but hopping from place to place brings an obligation to see the sights. Thankfully for me, Chatwin is a better guidebook. He sought out scenes, but his wandering was true wandering. He understood that something like sunrise on Fitz Roy should not be missed, but also that a walk down an empty country road, past a farm or orchard can also bring a full sense of being. He walked long and hard, exposed himself to the elements, but also spent days lounging about reading a book. No fear of missing out there. Kohn’s anxiety was brought on by being on a bus caught in a landslide area, and was relieved by some bird watching (it was much more complicated than that). The psychic movement was from the uncertainty of an imagined “what if” to the grounding of seeing a striking (but familiar) bird in a place both wild (the jungle at the edge of town) and grounded (near the pavement of the road). His grounding wasn’t a sense of complete familiarity— what you live when you are “at home”—but instead the grounding you feel when you feel the ground (that is, when it is not sliding or quaking). I think when I started out on this trek, I was anxious about some simple physical abilities—recent eye surgery and a knee that severely limits activity—and also I was leaving behind that sense of being “at home,” that clearly defined material space that includes a soft bed, a son, and a really great hound dog. It took some walking to regain my sense of a walking home, of being grounded by being on the ground, or in this case, on a bench with a book in the plaza of a tiny village in Chile.